Springtime is a dizzying array of renewal and color. The soft scents make me feel light and carefree. As my gardens move into their second season of the year, more bold colors of both petal and foliage emerge. 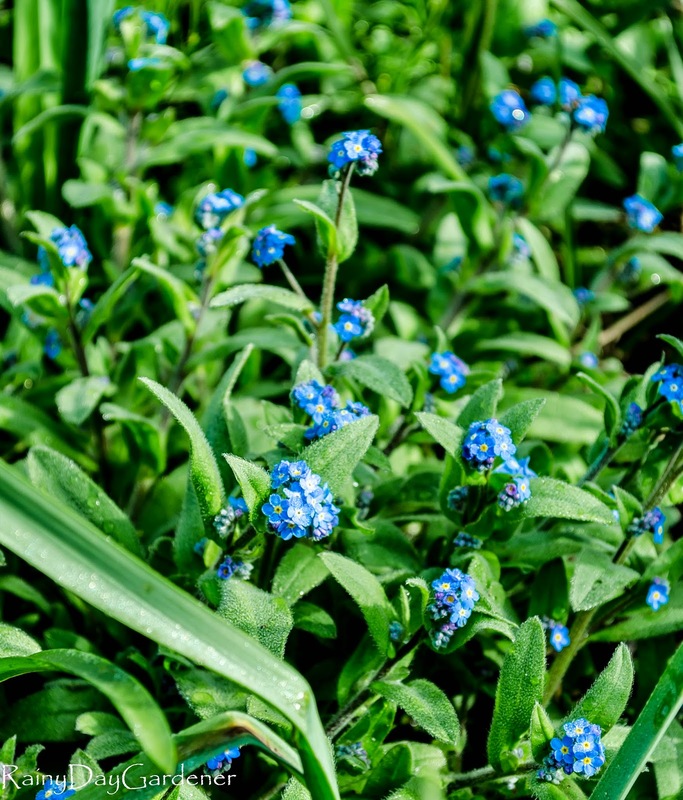 My favorite spring color is the blue hues of Forget-me-Nots. Those little blooms carry me back to a time in my childhood when I remember picking them with my best friend Sarah, from her mother's gardens. We made simple bouquets to leave on the doorsteps of our elderly neighbors on May Day. Our beloved dogwood tree is pumping out blooms again. It must be over 80. My husband's great-grandfather planted it. It's truly a beauty. I received a division of a fellow garden bloggers Kerria japonica 'Pleniflora' last summer. I didn't know what it looked like. It was a lovely surprise. Like many of you, I've been hard at work in my gardens. Weeding and transplanting has taken up a lot of my time. I was really happy that the clematis which I transplanted mid-March, quickly rebounded and has begun to pump out it's showy blooms. This older variety of clematis was introduced by the old firm of Bees of Colchester in 1950. It should produce another wave of blooms later summer/early fall. In other pink news, the Gold Heart bleeding heart fuschia's are looking fantastic. There is nothing like the bright pop of yellow foliage and dangling pink blooms. I have them placed with autumn and shield ferns. 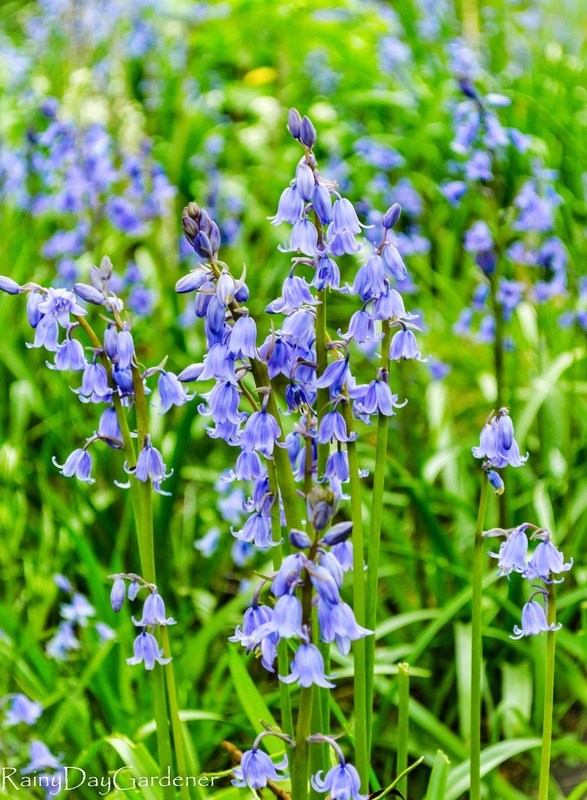 Golly, it just wouldn't be spring if my gardens weren't covered in Spanish blue bells. There are a lot of names for these invasive, spreading, bulbs, like Wood hyacinth. It's a good thing I love the color blue. The fruit trees are also in bloom. What cottage garden would be complete without them? I'll sign off with a shot of my tulips in containers. Ah, tulips in April. It's a sweet and soft month in the gardens. Wishing all a Happy Garden Blogger's Bloom Day! Visit Carol, our delightful host, over at May Dreams Garden to see what is blooming around the world on the 15th of every month. Ah i love your bleeding heart blooms, i wish i could grow it in my hot hot climate. Lovely flowers you got, just exquisite. Pretty! I bet the Spanish Bluebells are gorgeous en masse. May Day baskets are such a lovely tradition. Have your kids taken it up? They certainly have plenty of material to work with. Happy Bloom Day! That's a beautiful floral collection Jenni! Kerria japonica 'Pleniflora' is one I've been tempted by, love those cheery yellow flowers. 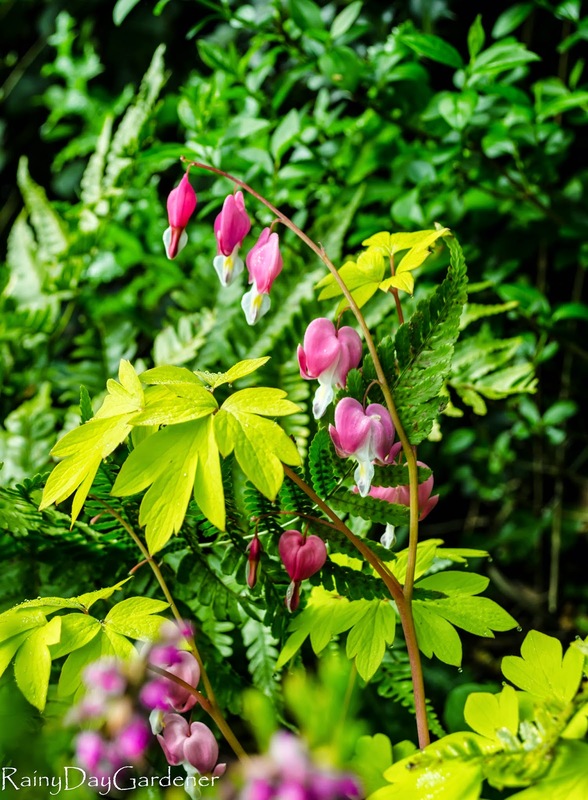 I love Gold Heart Dicentra, it's a great plant. And Forget-me-nots, love them too. Happy GBBD! In spring I'm always fond of the blues, like forget-me-nots and bluebells, magnificent. Your old dogwood does look amazing too, a real family treasure. You have a colorful and diverse collection of blooms. 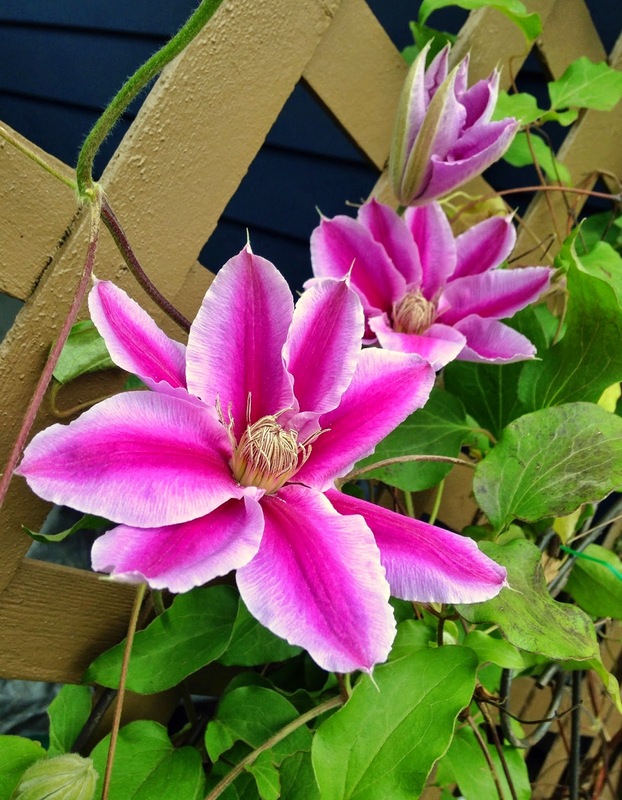 I love that Clematis and SO wish I could grow dogwood and tulips! 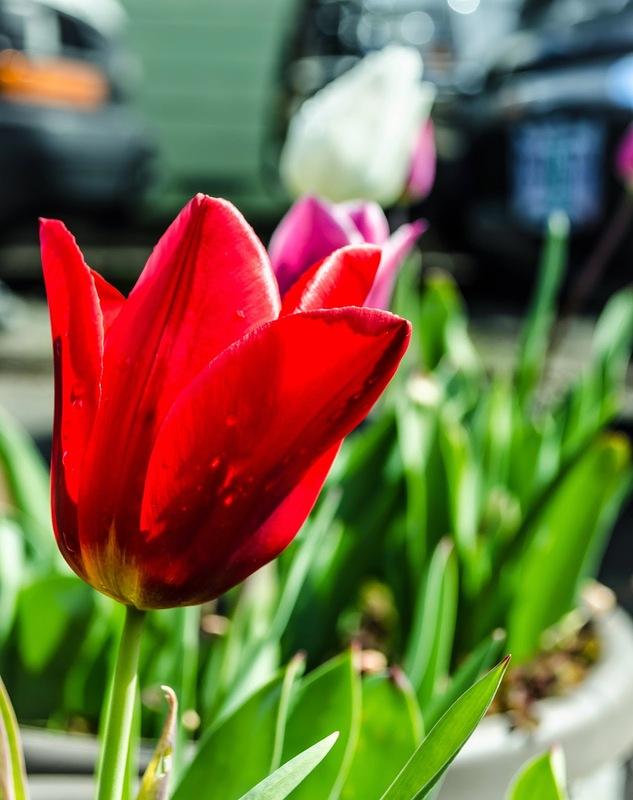 Spring is certainly underway there and you have such gorgeous blooms in your garden. 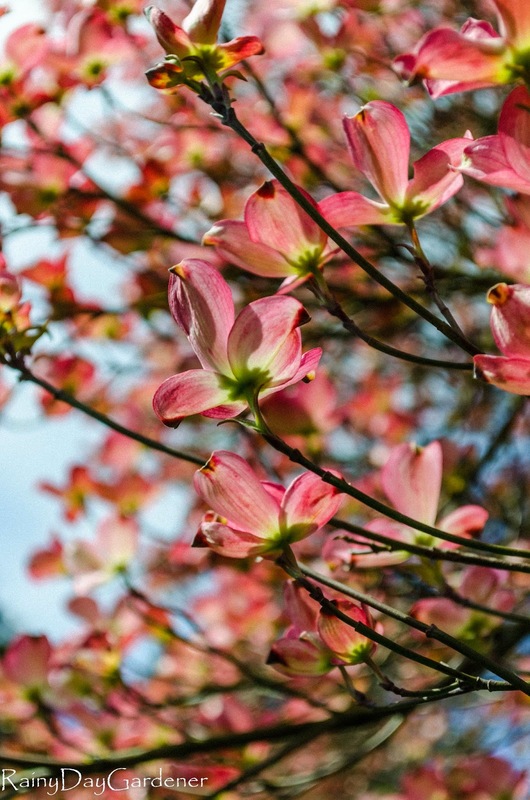 The dogwood and clematis are breathtaking! Happy Bloom Day and thanks for the lovely tour! You have beautiful color in your garden and you remind me I need more blue at this time of year - actually, all year round! 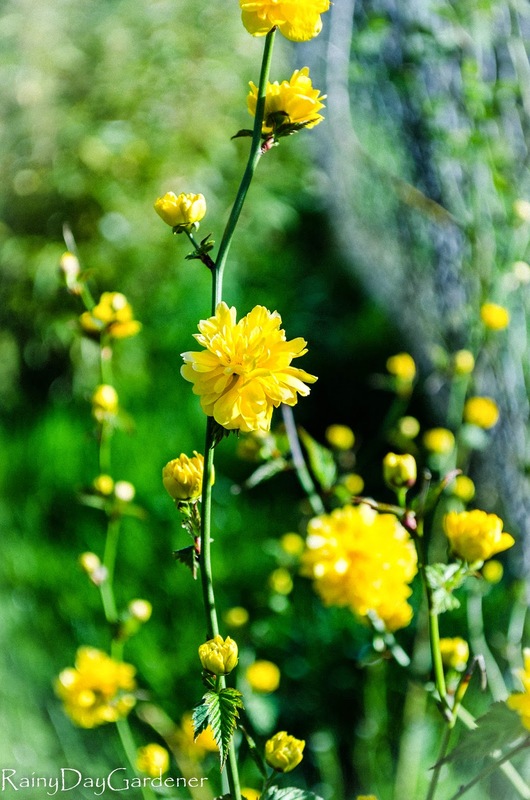 Kerria is a wonderful plant that always leads me to sweet memories of my gardening mother, who loved it. Happy Bloom Day, Jenni! So many splendid blooms. I particularly love the Forget-Me-Nots. That's not something that will grow here. The Bluebells also caught my eye. Absolutely beautiful. Oh, your Kerria is so pretty! I too hate those stupid Spanish bluebells. They pop up everywhere. Beautiful flowers. I'm still waiting for my Forget-Me-Nots to come up so I certainly enjoyed yours! Thanks for the great post. The color this time of year is really fab, and its great to see plants emerging with new growth. Loving the early blooms and many more to come as the days and months roll on. During Spring, I love spending time in our outdoor porch with a nice cup of tea to look out the garden. We don't have the tulips but my wife has some hyacinths and apple blossoms.